An Innovative Promotional Tee Marker Designed to Maximize Sponsor Visibility and Fund Raising Revenue. The Advertee™ Tee Marker is a new, innovative, eye-catching, value-added dimension for golf tournament sponsorship signs. It delivers the optimal advertising medium for event sponsors to improve their fund raising potential. Available in 5 colors, the Advertee™ boldly displays each sponsor's name and logo, features a built-in holder for up to 10 tees, a handy business card holder, even a cigar rest! 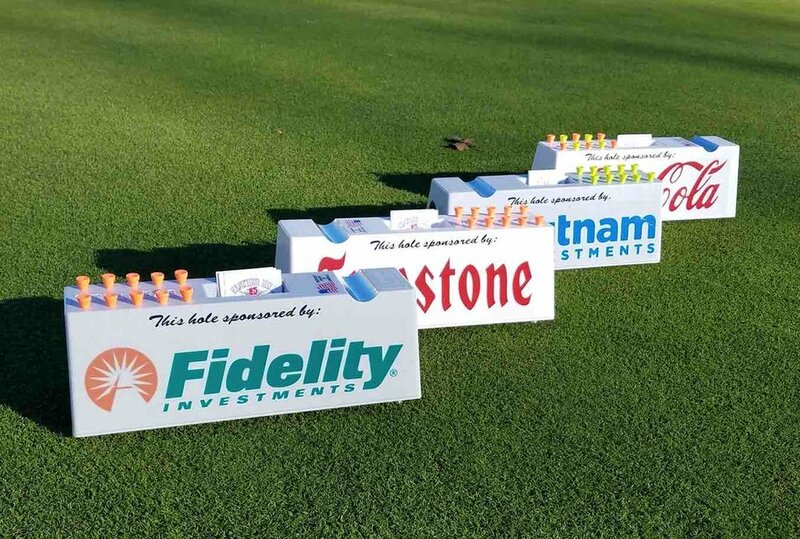 The Advertee™ Tee Marker is a new, eye-catching, value-added solution for golf tournament hole sponsorship signage. Available in 5 exciting colors and clear! Built-in holders for up to 10 tees and a stack of business cards! An Innovative, One-of-a-Kind Tee Marker That Maximizes the Fund Raising Revenue Potential of Every Single Hole. Contact Us | Copyright 2017, Advertee, Inc. Patent pending. All rights reserved.